Recently, I have been studying the Japanese language. There are several reasons for this, but one of them is very much related to the work of this weblog. The purpose of this weblog has been to explore, learn, and discuss the Ancient Wisdom that is the true foundation for Traditional Sciences, such as astrology once was. Much of the material currently available to astrologers is post-Aristotelian. As I discussed in previous articles, Aristotle taught a subtle, but quite significant, deviation from Traditional Wisdom with respect to the nature of Perfect Form and its relationship to physical manifestation. I have observed that this deviation is embedded in all of Western thought, science, and philosophy. Such a deviation did not occur in the East until the East was exposed to Western thought. One can find information and clues with respect to Traditional Wisdom in Japanese kanji. Recently, I have been studying time expressions, and the kanji for them are quite fascinating. In order to fully understand why these kanji are so fascinating, it is important to understand the original and primordial purpose behind astrology. As our ancestors became more consolidated into the material world, it was important to them to ensure that their earthly activities were still in harmony with the Divine Music of the Spheres. They looked to the heavens and studied the movements of the heavenly bodies to determine the time that their endeavors were in accord with this Divine Music. All nature is a vast and subtle movement to which the innocent soul is close attuned. Honor in all things the times and the seasons, keeping fast in the times of fast with diligence and care; rejoicing in times of feast with generous outpouring. No tree may blossom out of season, nor any flower greet springtime with austerity, but a maid lacking in inward control is broken from the rhythm. And God said, “Let there be lights in the dome of the sky to separate the day from the night; and let them be for signs and seasons and for days and years, and let them be lights in the dome of the sky to give light upon the earth.” And it was so. These are the traditions I am most familiar with; however, I would imagine that this is a Universal concept, and that it can be found in all traditions. To my joy and delight, I discovered that this concept seems to be embedded in the Japanese kanji for time expressions. On the left is the kanji for time, toki, and also, ji, the marker for hour expressions, the Japanese equivalent of “o’clock.” This kanji is made up of two other kanji. The element on the right is the kanji for “temple.” The element on the left is the kanji for “Sun.” Quite simply, the hours are marked by the temple watching the Sun. The Japanese word for time in the abstract sense and the word used to mark a number of hours is jikan. The kanji for jikan is to the right. As you can see, this kanji incorporates the kanji for time with a second kanji. This second kanji also includes the element for Sun, but it is inside an element that symbolizes a gate. The Sun is contained inside a gate! Another interesting kanji is found in the word, matsu, “to wait,” 待つ. The kanji is the first character in this word. The temple is in this kanji as well. The other element of this kanji, is labeled “going man,” by Rikaichan, a wonderful translation aid/kanji analyzer that works with Firefox. That element, or radical, is also found in the kanji included in the word, iku, “to go,” 行く. I think one could speculate that the kanji contained in the word for wait may indicate that human endeavors are being directed by the temple; in other words, people are waiting for the proper time for action! 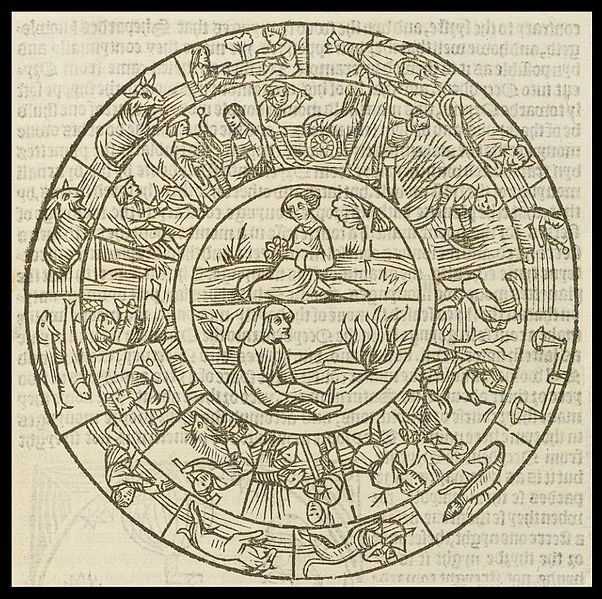 The study of astrology is primarily a study of cycles of time from the Great Year, marked by the Precession of the Equinoxes, over a period of approximately 25,600 years to the daily cycle of 24 hours, and many cycles in between. There is another cycle that we are much less aware of in the West, but which is still taught in Eastern traditions. This is the cycle of the unfolding of the Ages. This cycle is not necessarily marked by physical astrological signposts, but it is the cycle of our experience as Axial Beings. Inherent in Filianist thealogy is the understanding that we are not our bodies. We are not completely our souls either, but it is helpful to use the term soul as the individual Axial Being that undergoes the process of rebirth. This concept is not as simple as it may seem, but the complexity of this gets into matters well beyond the scope of this article, and truly, it is a bit beyond what we can understand fully from a non-Enlightened state of being. I have just introduced a term, Axial Being, and I believe that this term needs definition. An Axial Being is one that has Free Will. We must understand that Axial Beings are not necessarily the highest or most intelligent beings in manifestation. Animals are non-Axial Beings, but so are angels. Axial Beings are the souls that have the power to choose between good and evil and that can be something different than they were born to be. A cat will always fundamentally be a cat and will act as it natural and normal for a cat. There are a few very rare exceptions to this, but in general, this is true. By the same token, an angel will always be an angel and will act the nature of an angel. Axial Beings are the only beings that are capable of acting against their nature. A fundamental belief of Deanism/Filianism is that we have been around since before the dawn of time. The Filianic Creed begins: “I believe that I was created from before the dawn of time by the one eternal Dea.” This does not mean we believe that we have inhabited physical bodies the entire time. Indeed, the Filianic Creation Mythos speaks to an unmeasured period, after Creation and before time, where we lived in relative Union with Dea. 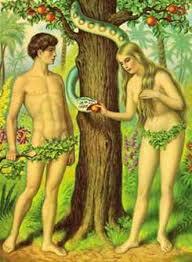 It is implicitly understood that at this time, we did not inhabit physical bodies, as we understand the concept today. It is for this reason that the Creation/Evolution debate that so divides Modern Western culture is ridiculously literalistic from the perspective of Essentialist and Filianist teachings. Where our actual bodies come from is really immaterial. It may be interesting to ponder and study, but this study says nothing about us as Axial Beings. At some point, Axial Beings began to inhabit the physical, human form. How and when this happened is beyond the scope of what we can learn through physical science. From tradition, we do have some teaching to inform us on this subject. This teaching is that of the unfolding of the Cycles of Time. There have likely been many full Cycles of Time since the beginning of time, but one Cycle of Time is the most that we are really capable of understanding from a state of non-Enlightenment. The Cycle of Time is analogous to the yearly seasons we experience and is a cycle of consolidation into matter. 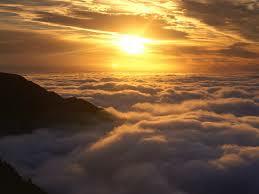 The first Age in the Cycle is the Age of Gold, or the Satya Yuga. In this age, our souls barely inhabit physical form, if they do at all. In the Age of Gold, we are mostly, if not completely, spirit. With each subsequent Age, the Age of Silver, the Treta Yuga, the Age of Bronze, the Dvapara Yuga, and the Age of Iron, the Kali Yuga, we become increasingly consolidated into matter. It is only in the Age of Iron that our souls are fully consolidated into matter, and the consolidation becomes heavier and stronger as the Age of Iron progresses. These Ages are not uniform in their length in terms of time. Each of the Ages is far shorter than the subsequent Age. The Age of Iron that we are currently in began around 5,000 or 6,000 years ago. Interestingly enough, the Judeo-Christian written tradition gives the time of Creation and of Adam and Eve as around the beginning of the current Age of Iron. While it is an overly simplistic interpretation to say that Creation began at this time, in a sense, there is some truth to it. We really can not truly understand the lives of our ancentresses prior to the beginning of the Age of Iron with information we can obtain from our senses, either directly or through reason. The reason for this is that we do not know the extent to which Axial Beings actually inhabited the physical human form in even the Age of Bronze, let alone in the Age of Silver or the Age of Gold. Tradition tells us that we are currently in the final stages of the Age of Iron, and we will be next headed into a new Age of Gold. For good reason, no legitimate tradition will tell us the exact time when this will happen, but will only give us clues and a general description of how long each Age lasts. This understanding plays a huge role in our analysis of disciplines such as traditional medicine and classical astrology. The Age of Iron is the age that we are the most consolidated into matter, and the consolidation increases as the Age progresses. This is the reason that what we think of as magic “worked” early in the Age of Iron, and does not really “work” very well today. As the Age of Iron progresses, we need more and more technology to accomplish what was accomplished through non-physical means at the beginning of the Age. This is why it is not correct to say that our forebears were superstitious when they used non-physical means for healing, such as appeals to aspects of Dea known as “gods and goddesses.” At the beginning of the Age of Iron, that likely still “worked.” These things do not “work” in the same way in the very late Age of Iron that we are currently in, but instead, we need more and more physical methods of healing, such as surgery and medicine. In my series, Astrology as a Traditional Science, I discussed that the seeds of the modern rationalist movement in the West started at around the time that Aristotle diverged from his teacher, Plato, on the subject of Perfect Form. On one level, this divergence was somewhat false teaching, but on another level, there is some truth to what Aristotle and his contemporaries taught. On a practical level, in applied sciences such as medicine and astrology, we must engage in observation in addition to study of traditional, metaphysical principles. As our souls became more and more consolidated into matter, they became further away from their Perfect Form, and as that happened, pure metaphysical principles did not “work” in on a physical level in the same way as they did in earlier Ages, or even as they did at the beginning of the Iron Age. So, for practical purposes, it might be useful to rely upon the information we derive from our senses in the late Iron Age, but we must still remember that Perfect Form exists, and we must also remember that in this late Age of Iron, we are as far away from Perfect Form as we can get in this current Cycle of Time. While I have discussed the Cycle of Time as a movement of decline and a movement away from our Perfect Form, please understand that this Cycle is as natural as the cycle of the seasons of the year. The Age of Iron will always follow the Age of Bronze, just as Winter will always follow Fall. This decline will happen no matter what we as Axial Beings do or do not do. There is another set of Ages that I believe that Axial Beings and societies do have a choice concerning, and that is the gunas, but that is a subject for another article. In the past three articles, we have explored the origins and roots of rationalism, the essential and metaphysical principles upon which astrology is based, and how astrological problems would be addressed under Essentialist (the traditional approach defended by Plato that was common to all civilizations and was first breached in Periclean Athens), Aristotelian, and nominalist philosophies. I also suggested that the Essentialist philosophy is soundest of these three philosophies. I also suggested that we approach astrology as a traditional science, rather than as a modern science. What does this mean? How can this be? Can we not trust what we can observe with our senses? This proposition is a difficult one for Westerners, I think. We are taught to question everything and that “seeing is believing.” Under a traditionalist approach, however, we understand that the only part of the cosmos that we can perceive with our senses is the sublunary sphere; all of the higher planes are beyond our senses. What we know of the higher planes is that which has been passed down to us from tradition. There is a certain arrogance to modern scientific reliance on our own observation and rational analysis, assuming that we know better than our forebears did. The modern attitude can be likened to that of a teenager ignoring the advice and wisdom of her parents. Traditional science presumes that our forebears knew more and understood more than we did, so we trust tradition over our current sense data. Does this mean that current research and our sense data are to be ignored by traditional science? Not at all. First of all, in the West, our tradition has been broken, particularly in the traditional science of astrology. There are many fine astrologers and researchers who are busy at work translating and analyzing texts from the past 2,000 years, but this is a poor substitute for an unbroken line of tradition passed down from teacher to student over millennia. Because of this, we do not have a uniform or consistent tradition to guide us. There are some principles and techniques that are uniform, such as the traditional planetary rulerships of the signs. There are other principles and techniques that are confusing at best and chaotic at worse, such as the various House systems. Furthermore, even if we had a solid, unbroken tradition, we would still need research and observation. This is because of the doctrine of the unfolding of the ages. For a detailed description of this doctrine, I will refer the reader to this article; however, the summary of this doctrine is that Axial Beings become more and more consolidated in matter as the greater cycle progresses. At present, we are in the Age of Iron, and we are highly consolidated in matter. While the metaphysical principles remain consistent and true, the application of these principles changes and becomes less pure. A technique that may have worked in the past may not work in the same way as this material age continues to unfold. A concrete example of this concept is the prediction of fertility using techniques that have been passed down from the Middle Ages and the Renaissance. In this day and age, we have reproductive technology to assist with such matters, so the techniques that “worked” in the Middle Ages and the Renaissance to predict whether an individual would have children may not work now, or more likely, may work, but in a different way. This approach to research and observation is not the same as the modern approach. When we undertake this research, we are not attempting to innovate, nor do we have any notion that we will “discover” something unknown to our forebears. What we are doing is acknowledging the unfolding of the ages and that the sublunary plane is the world of flux and change. The principles remain the same, but the application of these principles changes over time. This is where the Essentialist understanding of metaphysics provides more flexibility than the Aristotelian understanding does. The Essentialist understanding of metaphysics is that the material reflects the metaphysical; it does not necessarily mimic the metaphysical. Our theories and hypotheses must be derived from sound metaphysics and tradition; however, a reasonable amount of variance is allowed and even expected. We can adapt our methods and techniques to be more accurate in a different age without challenging or upsetting the underlying principles. It may seem like this discussion has led us back to the methods that many astrologers already use in their practice and in application. In a sense, that is absolutely correct. Adopting an Essentialist philosophy does not necessarily change what we do on a practical level. What does change is how we think about what we do, and how we analyze and explain our craft. One of the areas of discomfort and disharmony for and between Traditional/Classical Astrologers concerns how strictly we adhere to the lessons of astrologers of the past, and whatever approach we take, it is a source of criticism from modern astrologers. This makes for some rather uncomfortable conversations in our attempts to explain whether and how we can adhere to tradition in a world that is very different from the world in which our predecessors lived. As I have also demonstrated, there are flaws in the Aristotelian approach, and these flaws require mental gymnastics to explain and reconcile when we are confronted by the findings of modern science. While the modern criticisms of Aristotelian philosophy have merit, the modern answer to these criticisms does not. The error in the Aristotelian approach is not a lack of understanding of modern scientific principles; the error is in the departure from tradition. Essentialist philosophy provides us with flexibility and gives us the guidance we need to adapt and adjust our practice to a changing world. This philosophy expects and can accommodate variations between our tradition and our sense data in a way that Aristotelian philosophy cannot. Essentialist philosophy also sets the parameters for adjustments to our practice. The first parameter is that our adaptions derive from our tradition and do not disrupt tradition. The second parameter is that we only adapt when it is necessary to obtain accurate readings in a more material and consolidated time, and these adaptations are vigorously tested. We adapt and adjust, we do not innovate. I understand that this series of articles may be a bit challenging. The ideas that have been presented have been the result of a long dialogue and struggle that I have had in adapting my practice to an Essentialist understanding of the cosmos. This struggle was reminiscent of the struggle I had several years ago when I was converted to Classical Astrology from Modern Astrology. Like that struggle, this one was difficult and painful, but the end result was well worth the struggle. For me, it has given me a new and richer understanding of our craft, and on a practical level, I believe it has allowed me to give more accurate and helpful readings to others. We have discussed the origins of rationalist thought, and the 7 Divine Principles and the 12 Archetypes. So, what does this all mean, and why does this matter to astrology as an applied science? Let us go back to the disagreement between Plato and Aristotle on the issue of Perfect Form, and the later introduction of nominalism. If you recall, Plato taught that Perfect Forms exist at the level of the Divine. This teaching was not unique to Plato, and this is one of the basic precepts of essentialism. Aristotle taught that all Perfect Forms must manifest in the material world, and any Perfect Form that does not manifest in the material world does not exist. The later philosophy of nominalism teaches that only the manifest world exists. Why do these differences matter? In astrology, the Perfect Forms would be the Divine Principles and the 12 Archetypes. According to Plato, and prior Traditional teachings, while the physical manifestation of these Forms derive from the Perfect Form, they are not necessarily perfect representations of these forms. Also, Perfect Forms may exist without ever becoming manifest in physical form. According to Aristotelian thought, all Perfect Forms must be manifest in physical form. Nominalist thought would not acknowledge any Forms beyond manifest forms. While nominalist thought would state that the cosmos is the manifest universe, in the Traditional Model of the Cosmos, the manifest universe is the sublunary plane, and only the sublunary plane. 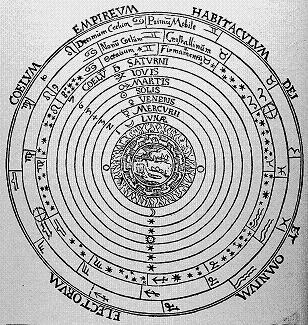 Plato and Aristotle would agree that the Traditional Model of the Cosmos is true and that the Solar System is a microcosm of the full cosmos. Under this Model, the stars and planets that we can see are a visual model of the larger cosmos that we can not see. The disagreement between the philosophers is over the question of whether what we can see is an exact replica of the cosmos we can not see. According to Platonic thought, it does not have to be. If what is seen in the physical sky does not match the Model of the Cosmos, it is interesting, but it does not change the metaphysical principles involved. According to Aristotelian thought, if what is seen in the physical sky does not match our teachings regarding the Model of the Cosmos, this calls into question these teachings. One may ask, if we accept the axiom, “As above, so below,” does this not mean that it is Aristotelian thought that must be true? Should not what we see on the material plane match the metaphysical principles we can not see? Not necessarily. There is another axiom we can use to explain discrepancies between the physical and the metaphysical: “Earth moves, but Heaven is still.” If one understands this axiom, one can see that it is not possible for a Perfect Form to manifest on the physical level. Perfect Forms only exist at the level of the Highest Heaven. 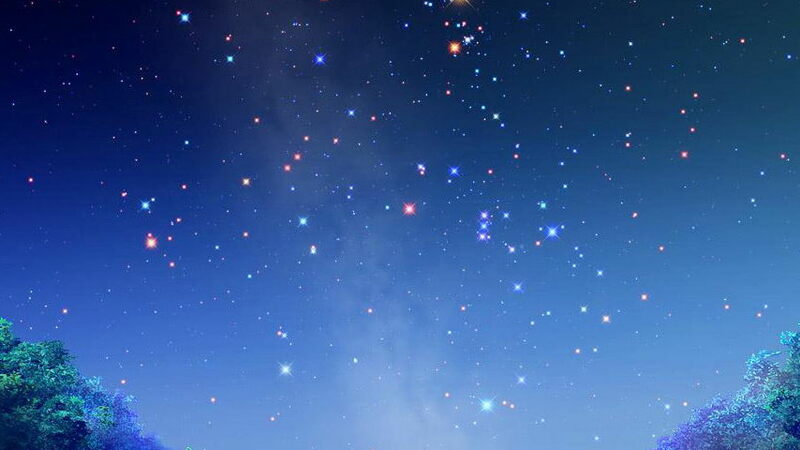 Even at the level of the Sphere of the Fixed Stars, manifestation becomes imperfect. This is why there can be evil fixed stars, such as Algol. By the time we get to the level of the sublunary plane, forms become quite imperfect. Forms we can see are reflections of the Perfect Form, but just as the reflection of the Moon does not look exactly like the physical Moon in the sky, the reflections of Perfect Forms do not look exactly like the Perfect Forms in the Highest Heaven. Combining the axiom, “As above, so below,” with the axiom, “Earth moves, Heaven is still,” one can see how Platonic and Traditional Essentialist thought would be the soundest philosophy and doctrine. Again, why does this matter? Let us apply the three different philosophies to the 2 crises in astrology, the “discovery” of a heliocentric solar system, and the “discovery” of the Outer Planets. The “discovery” of a heliocentric solar system is only a difficulty if one adheres to nominalism. According to both Platonic and Aristotelian thought, an observation that the physical Sun is the center of the physical solar system is consistent with the metaphysical principle of the Solar Heart being central, see Mummies and Luminaries. The manifest solar system exists in the sublunary plane, so an observation that the physical Sun is central to the physical solar system does not challenge the Traditional Model of the Cosmos in any way, and in fact, this observation supports generally accepted metaphysical teachings. The only way that the “discovery” of a heliocentric solar system can challenge the Traditional Model of the Cosmos is if one believes that this model is describing the physical, manifest universe. The “discovery” of the Outer Planets is a bit more complicated. If one adheres to nonimalism, then the discovery of the Outer Planets becomes of utmost importance. According to this philosophy, it is the physical planets themselves that impact us, so any new planets that are discovered must be incorporated into practice. In fact, we may even need to include bodies such as asteroids, comets, and the moons of other planets into our practice. If we decide to include some, but not all bodies, we must have a good reason for doing so. The burden of proof is on the exclusion of these planets under this analysis. The “discovery” of the Outer Planets is even more problematic for Aristotelian thought. According to this philosophy, the physical universe must be a replica of the metaphysical cosmos. The “discovery” of extra planets is inconsistent with the doctrines of the 7 Divine Principles and the Traditional Model of the Cosmos. This creates a huge crisis. Do the 3 extra planets mean that there are 3 extra spheres to the cosmos? Are there 3 more Divine Principles? If the physical solar system must be an exact replica of the full cosmos, this would seem to be the case. The “discovery” of extra planets calls into question past metaphysical teachings, and if these teachings are to be preserved, there must be an explanation. History has born this out. 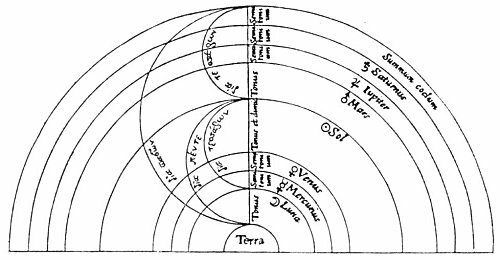 The “discovery” of the heliocentric model of the solar system did not disrupt the practice of astrology; the “discovery” of the Outer Planets did. The “discovery” of the Outer Planets is not a problem for Platonic and Traditional Essentialist thought. Under this philosophy, one does not expect the physical universe to be the exact replica of the entire cosmos. The physical universe reflects the entire cosmos, but there can be and probably are, variations. The fact that there are more physical planets than are accounted for in the Traditional Model of the Cosmos or in the 7 Divine Principles does not change anything. The traditional teachings are preserved. The system that has been passed down for millennia does not need to be revised or changed. 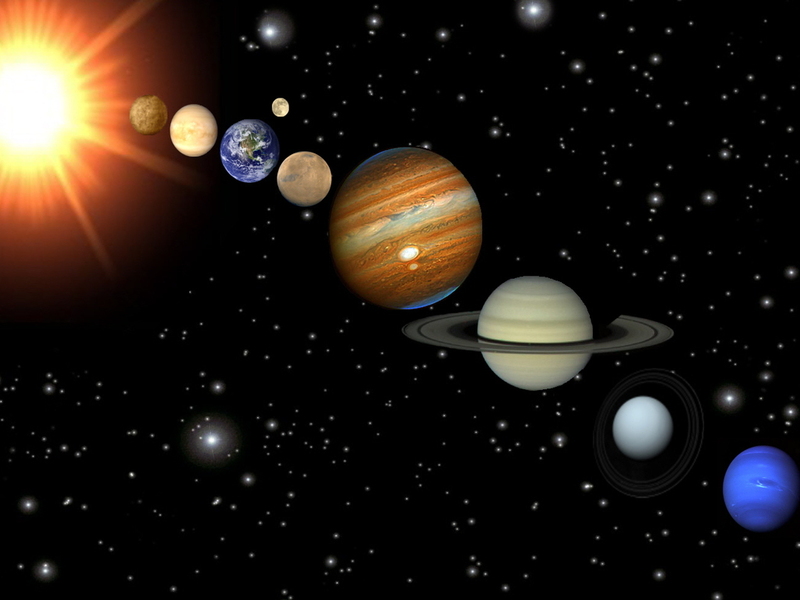 The Outer Planets can not represent Divine Principles, because tradition teaches us that there are Seven Divine Principles and the Archetypes that these Principles rule. We treat the tradition that has been passed down to us as sacrosanct. Under Platonic and Essentialist philosophy, the movements of the Outer Planets may have meaning for us. This does not disrupt tradition. In astrology, there are other points that are traditionally recognized as meaningful that are not equated with Divine Principles. Some examples are the Lunar Nodes and Arabic Parts. On the other hand, the Outer Planets do not have to have meaning just because they exist, have physical properties similar to the Traditional Planets, and can now be perceived with instruments. The burden of proof is placed on assigning them meaning, rather than on not assigning them meaning. On the other hand, under Platonic thought, even if the Outer Planets have meaning, they can not rule signs, and they do not represent extra cosmological spheres. There are Seven Divine Principles, not nine or ten, and their relationship to the Archetypes is a matter of well established tradition. Assigning rulerships to the Outer Planets disrupts the system in a way that attributing meaning to them does not. As you can see, returning to Platonic and Traditional Essentialist thought frees us to observe the physical universe and to adjust our practice accordingly. At the same time, it also anchors us and gives us boundaries for these observations and adjustments. I intended this to be the final article in these series, but this explanation ended up being longer than I expected. Part IV of this series will explore the role of research and observation and its relationship to traditional teachings. Astrology is one of the few traditional sciences that is still being practiced. As I discussed in my previous article, in the past, all sciences were traditional sciences, but over the centuries, traditional science was replaced by modern science. While rationalism and modern science have invaded astrology, and many astrologers may not be aware of the traditional principles upon which this craft is based, these principles are deeply entwined in the tools and methods that astrologers use. The most basic tools that astrologers use are the planets and the zodiac. The physical planets and the zodiac are physical representations of deeper metaphysical principles. They are not the principles themselves. A metaphor I have been taught to explain this concept is that of the reflection of the Moon on the water. The reflection may not look exactly like the Moon that it reflects, but the Moon is still the source of that reflection. In the same way, the planets and the zodiac that we can see reflect principles that we can not see. The planets reflect aspects of the Divine, whatever name we may use for the Divine. My present spiritual tradition is Filianism so I will be primarily using that spiritual language, although I will also incorporate language from other traditions to the extent I am able to speak knowledgeably about the tradition. These principles are not tied to any specific religion, however, and they are part of universal traditional wisdom. Readers from other spiritual traditions, please feel free to translate these principles into your own spiritual lexicon. Below are the descriptions of the Seven Divine Principles. I will include the Roman planetary name, the name of the Filianic Janya (or Angel), and the Eastern element (for the non-luminary principles) in my description. I understand that there is also an association with the Judeo-Christian archangels, but in doing a brief internet search on the subject, I did not find agreement or consensus, and I do not have enough personal knowledge to sift through the differences. So, please forgive that omission. The Sun, Sol, Sai Raya – The Solar/Creative Principle. In the Filianic tradition, this principle is associated with (but not synonymous with) the Mother. 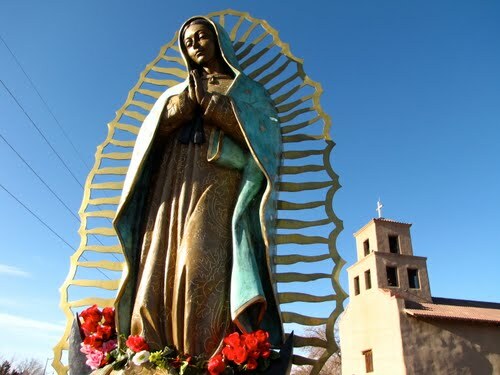 In the Christian tradition, this principle is loosely associated with the Risen Christ, and in the Roman Catholic tradition, with Our Lady of Guadalupe. The Solar Principle is the source of all life and energy. The Solar Principle is also the principle that links us with the One Spirit, and we each carry a microcosm of that principle in our own Heart. The Moon, Luna, Sai Candre – The Lunar/Sustaining Principle. In the Filianic tradition, this principle is associated with (but not synonymous with) the Daughter. This is the principle that sustains our life in the material plane. This principle is also the Redeeming Principle and the bridge between our human existence and our Solar Heart connection with the Divine. Just as the Moon reflects the light of the Sun, the Lunar Principle reflects the Solar Principle. Just as we can not look directly at the Sun, but can look directly at the Moon, the Lunar principle is the principle that we can understand. The Lunar Principle is also the principle of Divine Sacrifice, which is of course found in the Christian tradition, but the principle is as old as time itself and is found in every religion. Mary, in her aspect as the Queen of Heaven, is a symbol of the Lunar Principle in the Roman Catholic tradition, and Quan Yin is a symbol of the Lunar Principle in the Eastern tradition. Saturn, Sai Rhavë, Earth – the Destructive Principle. In the Filianic tradition, this principle is associated with (but not synonymous with) the Dark Mother, the Light beyond the Darkness and the Darkness beyond the Light. This principle is the hardest to explain and understand, and in practical application, this principle is seen as malefic but is an aspect of the Divine as well. Paradoxically, the Rhavic Principle is the principle that both binds us to the material plane and releases us from it. This principle tends to be quite severe in application and is associated with time. While we can acknowledge that the Rhavic Principle is Divine, it is not a principle that one would invoke or embrace. One can not truly understand this principle without having reached a very high level of Enlightenment. Mercury, Sai Mati, Water – Divine Intelligence. In the Eastern tradition, this principle is seen as the “Little Sun” and is very close to the Solar Principle. In the Judeo-Christian tradition, the Matic Principle can be seen in Sophia, Divine Wisdom. This is the principle from which Enlightenment comes, and indeed, the name Buddha (“the Enlightened One”) and the Bodhi tree (“the Tree of Wisdom”), are derived from one of the names for the Matic Principle. Venus, Sai Sushuri, Metal – Divine Love. Even though in the West, unfortunately, this principle has been associated with only romantic love, this principle encompasses all forms of love and is the principle from which all Love and Beauty flow. The Sushuric Principle is gentle and is also related to Divine Mercy. One could argue that Jesus taught the Sushuric principle. The Sushuric Principle is also associated with the beauty of manifestation. Mars, Sai Vikhë, Fire – Divine Protection. The Vikhelic Principle is both easy to understand and difficult to explain. The Vikhelic Principle is the principle of conflict. In order for there to be manifestation, there must be separation from the Divine. Once this separation takes place, conflict becomes inevitable. On a spiritual level, the Vikhelic Principle is the struggle between Good and Evil. In the history of this world, the Vikhelic Principle is overbalanced to an extreme, but in its balanced form, it is a protective principle. When the Vikhelic Principle is balanced, the conflict is against demons, including one’s own internal demons, and not against other human beings. The Vihkelic Principle is also the principle of Free Will and is the ability to choose between Good and Evil. Jupiter, Sai Thamë, Wood. Divine Harmony. The Thamic Principle is the principle of order and harmony. This is the principle of the Music of the Spheres and governs the rhythms of all life. The Thamic Principle also governs societal structures and relationships. Axial Beings, such as humans, have the choice to either join with the harmony of the Thamic principle or to set themselves against it. Non-Axial Beings, such as animals and angels, do not have such a choice and will naturally take their proper place in the Celestial Harmony. For a fuller description of these Principles, I will refer you to this article. On the human level, the Seven Divine Principles are mediated through the Twelve Fundamental Archetypes of humankind, Aries, Taurus, Gemini, Cancer, Leo, Virgo, Libra, Scorpio, Sagittarius, Capricorn, Aquarius, and Pisces. Just as the planets are the reflections of the Seven Divine Principles, the constellations of the zodiac are the physical reflections of the Twelve Fundamental Archetypes. When the Divine Principles are mediated through the Archetypes, they may be enhanced or hindered through that mediation, depending on the Archetype. The mediation of the Principles through the Archetypes is the essentialist basis for astrology. It is also the basis for all other traditional sciences, such as alchemy and traditional medicine. Sadly, this knowledge and understanding has largely been lost in the West. Astrology is one of the few disciplines that still actively studies and applies these principles. Understanding astrology in this manner changes nothing and changes everything. If nothing else, this understanding gives us a foundation to stand on when we are faced with substantialist criticisms of our craft. I think that many of us, including myself, feel pressure to “justify” our craft in light of “scientific evidence,” but I think that this is ultimately a mistake and a cheapening of the great heritage that we have been given by our forerunners. Of course, we need to use observation and research to refine our accuracy and our skills at application (which will be the subject of my next article), but we do not have to “justify” ourselves based on the “scientific worldview” of rationalism. Girded with an essentialist understanding of the underlying principles, we can avoid the trap of insecurely practicing our craft as a modern pseudo-science, and instead, we can boldly practice our craft in the manner of our forerunners, as a respectable and useful traditional science.